Operating one of Vancouver’s premium outlets for organically sourced artisanal baked goods has never been an easy task. With our duties ranging from handling inventory, merchandising products, and scoping out new and exciting recipes, there is never really a dull moment! Oh, not to mention baking bread. We do a lot of that. With such a hectic schedule, we often experience curious customers who will enter our establishment with a bevy of questions about the ins and outs of our business. We answer them to the best of our abilities, time constraints aside, but sometimes people simply want more information. No strangers to providing in-depth background knowledge about our products, we figured; why not address one of the more frequent queries we are faced with. As many of you may know, all of our breads are made specially by our head baker and A Bread Affair founder, Tanya, using a locally sourced sourdough starter. 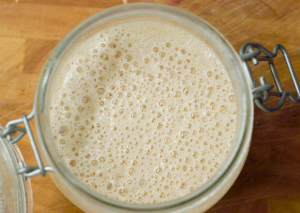 Wait, hold the phone, a few of you may be saying, what exactly is a sourdough starter? Well, the specific recipe Tanya uses actually originates from Napa Valley grapes and the skins that they produce. In fact, it is fairly common for professional bakers worldwide to have special sourdough starter compounds that are derived from specialty (sometimes secretive) locations, sometimes even possessing rich cultural or familial backgrounds. One of the most essential components of sourdough starters revolves around wild yeast. This type of yeast is significantly different than the commercial yeast that you see at most supermarkets, a product whose omnipresence can be attributed to cheap manufacturing costs and easier storage. Wild yeast can be found in many places including bags of flour, on the surface of grapes, and even in the air. In contrast to its active-dry cousins, this baking tool can be tricky to work with, as it requires more maintenance and monitoring, needing acidic environments and cooler temperatures to reach full potency. 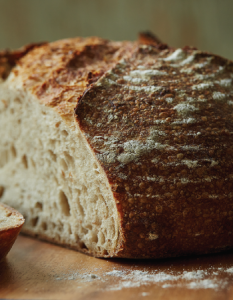 We consistently use wild yeast at A Bread Affair because it offers a much more palatable texture and flavor when compared to its supermarket-bound cousins. 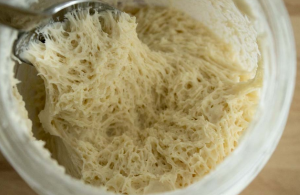 While you may be thinking that this form of yeast is something that is only reserved for the most dedicated and talented bakers (no, we aren’t trying to pump our own tires… too much), in reality, all you need to cultivate it in order to make a sourdough starter is flour and water. Simply mix these two ingredients together, and let them sit for a couple days. By observing it, you will notice that small bubbles start to form. This shows that the wild yeast is becoming more active and beginning to multiply! In order to perpetuate this cycle, feed the mixture with more flour and water, stirring occasionally. Eventually the starter will become quite frothy and very bubbly. This stage essentially means that it is ‘ripe’ and ready for use. One of the great things about this excessively simple recipe is that any type of four, whether it be whole wheat, white, or rye, will generate similar effects. For those experimenting for the first time, we generally recommend starting with all-purpose flour as it is exceptionally easy to work with. Following this process, you can begin putting together everything you need to craft some delicious homemade bread. Always remember to double check the ratio of flour to water that the recipe calls for prior to baking, and adjust accordingly. Once you have the initial ratio prepared properly, you can simply continue to add water and flour in order to make some exceptional sourdough starter. A Bread Affairs’ own perfected sourdough starter is used in many of our loaf recipes and it is what makes us stand apart from all the other bakery shops in town. By using the finest organic ingredients we can source, our starters produce the most delectable bread, ever. Visit our Granville Island bakery and see for yourself.